Officials eager for even the tiniest signs of hope were once again disappointed after data released following the weekly market reopening missed expectations, highlighting the ongoing contraction in the Japanese economy. 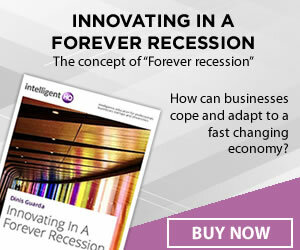 The nation has struggled to regain its composure, only narrowly avoiding a fifth recession in seven years. Weaker trade has been a major detractor from the economy, with exports falling by -10.10% on an annualized basis. The only reason the surplus has remained intact is because imports have fallen by a faster pace, tumbling by -23.30% over the last 52-weeks. While part of the softness can be attributed to weak external conditions, trade is up in certain places, notably the European Union which has seen imports from Japan climb 9.90% versus a year earlier. However, other economic metrics are also evidence of the ongoing strain to get the economy back on its feet. Manufacturing activity in particular continues to retreat, evidenced by the 47.6 preliminary PMI print, a moderate drop from the prior month’s 48.2 reading. Aside from highlighting the weak trade conditions, it is also testament to the rising Yen, which by itself is hurting export competitiveness. Taking all these points into account, it is important to recognize that each time the data retrenches further, the Yen continues to appreciate. Although policies are broadly designed to add to the monetary base and contribute to a cheaper currency, the prospect of the carry-trade is what has driven the majority of Yen weakness. Now that other major advanced economies are entering negative interest rate territory and risk is unwinding, the carry-trade has been the first major victim of shifting risk sentiment. 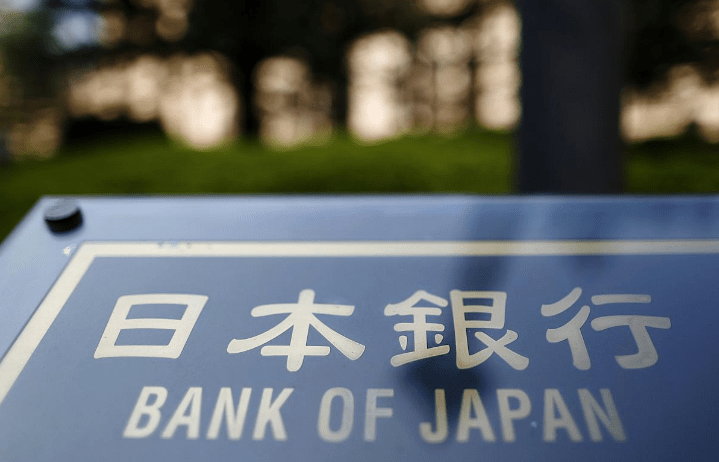 If conditions continue to worsen in Japan, the recent strengthening is just the beginning for a longer-term trend of appreciation in the currency. While recent data from France and Germany may suggest that European GDP is back on track, below trend growth continues to hobble the aggregate union, with most other members failing to capitalize on the benefits of record low interest rates and asset purchases designed to stoke economic activity. The most recent region-wide flash composite PMI underlines the uneven pace of recovery amongst regional economies, with the figure falling to the lowest level in 16-months, a sign that accommodation has fallen short. Additionally, recent consumer price index figures emphasize the worsening inflation outlook, with the headline CPI figure slipping back into deflationary territory during April to -0.20% on an annualized basis. With GDP growth forecast to slow during the second quarter, speculation is high that the European Central Bank will be forced to do more, further pressuring the Euro to the downside and adding to the ongoing weakness in the EURJPY pair which has fallen -8.51% over the last 52-weeks. Reviewing recent price action in the EURJPY pair shows that the risk factors remain to the downside over the near-to-medium term. The downward bias is evident thanks to both the 50 and 200-day moving averages continuing to move lower over time after completing the “death cross” formation back in November. 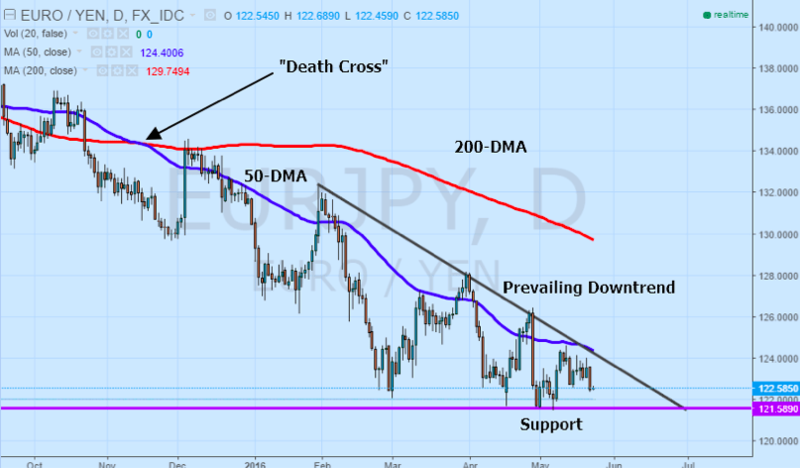 With both moving averages trending above the price action, these levels are acting as resistance against any rebound in the EURJPY pair over the near-term, especially after the bearish crossover. Outside of the moving averages, the emergence of a descending triangle pattern adds to the prevailing bearish sentiment, with the consolidation between critical support at 121.590 and the prevailing downtrend forming the basis for the pattern. While trading the consolidation is not suggested due to the tightening risk-reward conditions, a candlestick close below support would be indicative of a triangle-based breakout to the downside to be accompanied by renewed momentum and higher than average trading volumes. Although the US Federal Reserve could alleviate pressure on both the Bank of Japan and European Central Bank to add further accommodation by opting to raise rates, the EURJPY pair continues to be saddled with the weight of a consistently worsening Japanese economy.Although the BoJ has embarked on a massive stimulus program designed to weaken the Yen, each subsequent negative economic data point sends the currency surging higher. If fundamentals in Europe continue to deteriorate, the Euro might also be set to fall further, hurting the outlook for the EURJPY pair. With the technicals displaying a predominantly bearish bias and no near-term relief in the pipeline for either respective economy, the risk factors for EURJPY remain predominantly to the downside over the near-term.